Extends inputfield dependencies so that inputfield visibility or required status may be determined at runtime by selector or custom PHP code. A module for ProcessWire CMS/CMF. Extends inputfield dependencies so that inputfield visibility or required status may be determined at runtime by selector or custom PHP code. Custom Inputfield Dependencies adds several new settings options to the "Input" tab of "Edit Field". These are described below. Note that the visibility or required status of fields determined by the module is calculated once at the time Page Edit loads. If your dependency settings refer to fields in the page being edited then changes will not be recalculated until the page is saved and Page Edit reloaded. Install the Custom Inputfield Dependencies module. Optional: for nice code highlighting of custom PHP install InputfieldAceExtended v1.2.0 or newer (currently available on the 'dev' branch of the GitHub repo). The custom inputfield dependencies are set on the "Input" tab of "Edit Field". 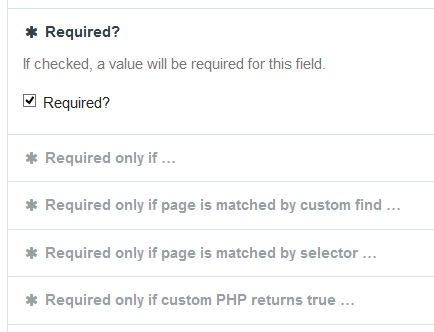 Use InputfieldSelector to create a $pages->find() query. If the edited page is matched by the selector then the field is shown. As above, but the selector string may be entered manually. In most cases $page refers to the page being edited, but note that if the field is inside a repeater then $page will be the repeater page. As there could conceivably be cases where you want to use the repeater page in your custom PHP the module does not forcibly set $page to be the edited page. Instead, a helper function getEditedPage($page) is available if you want to get the edited page regardless of if the field in inside a repeater or not. 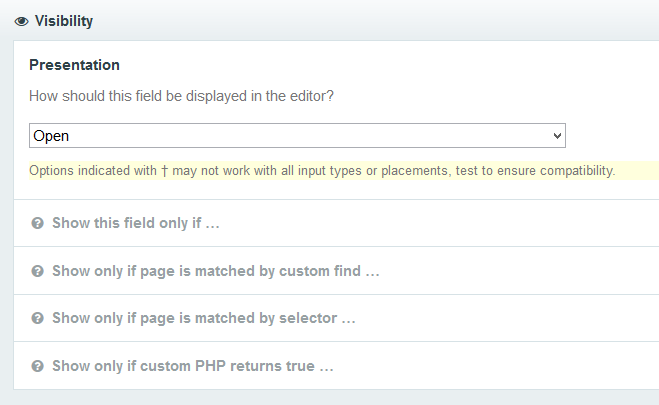 The settings inputfields are the same as for Visibility above, but are used to determine if the field has 'required' status on the page being edited. Thank you so much Robin, I can *finally* do what I wanted to ^_^ ??? ?